Honduras is a terrible country in which to live. If you’ve never been there, it’s likely you never planned to visit in the first place. Classified in similar context as the handful of other third world and developing countries in Central America, Honduras boasts the city that is the murder capital of the world. Long exploited by foreigners and Hondurans alike, it is a literal banana republic in the most raw and rugged sense of the term. There is little to no economic opportunity for its citizens. It has a per capita of less than $200 per month, or roughly $6 per day. It has crumbling infrastructure. Corruption runs rampant among its military, police and legal system. If you find yourself ill, you are better off catching a flight from the country than being treated in it’s hospitals. Houses are guarded by tall, unfinished walls topped off with rebar and broken glass. Garbage lines the streets and is burned in uncontrolled fires on the side of the highway. Children swim, bathe and drink from rivers full of trash and human waste. There’s really nothing good of which Honduras can boast. Who Will Stop This Migrant Caravan? When we see this caravan of immigrants en route to the US it is not with light heart that we bite our tongue and hold back our political commentary. On the contrary, a mass exodus from the country makes my gut wretch. It reminds me of every single person who is living, or attempting to live, in the country. In a more profound sense, I am reminded that we never choose the place of our birth. That is assigned to us. We can only do our best to manage the circumstances around us. Which those of us in first world nations do a great job of complaining about. The power is out. Our vehicle has a scratch. The restaurant is out of our favorite side of mashed potatoes. While we fixate ourselves in our own little world, the world around us is moving. This, more broadly, is called immigration. And, for the most part, it is a healthy transfer of the best the human race has to offer itself. Of course there are always exceptions. Drugs, weapons and bad people are smuggled across borders. Criminals and kind people alike benefit from increased opportunities. But immigration is important for the world, when done correctly. In a sense, nobody should stop the flow of people between borders. But we all should take notice of the role we play as migrants and travelers alike. For every step across a new border is an opportunity to bring positive change into the world. 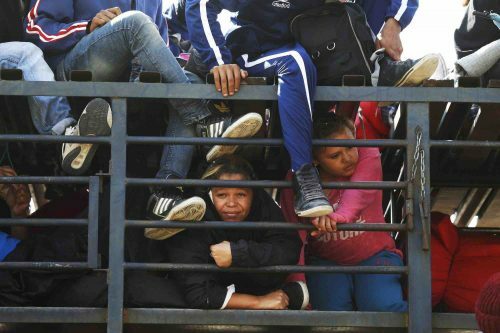 This migrant caravan is not the problem, nor the solution. It is a demonstration, on a world stage, that we need to meet at the corner of Travel and Immigration. We, blessed with enough in life to be reading this article, ought to plan a brief trip to that intersection to meet those who caravan without. Thus where we meet (and the sooner we do) is important. Because the best humanity has to offer is exchanged in these moments. We are proponents of responsible tourism. In fact, our entire existence now revolves around the idea of inspiring and informing people on how to “Travel with Purpose.” We don’t take that expression lightly. It is, quite literally, the core of everything that we believe and the impetus of every action we take in each day. Remember how bad Honduras is? The crime and corruption and economic repression? Remember the filth and waste and, well, you get the point. It’s pretty bad there. Which is exactly the reason you should plan a trip to Honduras. Honduras needs you to go and make it just a little better. Each man, woman and child in that caravan (and every one to follow) left his or her home in Honduras because there was nothing left to build or defend. They abandoned hope. Or, perhaps, hope abandoned them. We have started Called To Wander as a way to encourage those of us with the means to travel. But we want you to travel with purpose. We want you to see the value you provide in connecting with locals in a country like Honduras. It is ripe for opportunity to love in a way love has long since not been shown. If you’ve invested the time and money into planning and going on a trip to any part of the world, no doubt you have returned with a piece of that country as a part of you. Here’s the catch: You also left a part of you there. What part did you leave? Do you cringe now looking back at how you haggled in the marketplace about saving a buck here or there? Or do you relish the relationships you had, if only in passing, with people you met? We love people. And we love to travel. It is who we are and, quite frankly, I do not think these two can be separated in our lives at this point. In our previous chapters, Lindsay and I both wandered various parts of the world without ever coming into contact. It was only a matter of time, of course, before the world was made so small that we couldn’t help but notice each other. We bumped into each other while serving children and families in Cuba. In that moment our lives changed forever. Our stories became one on a small Honduran island eighteen miles into the Caribbean. 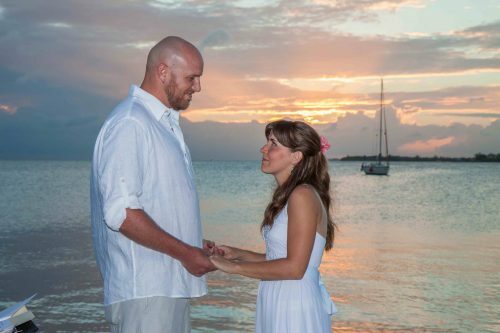 We were married on December 31, 2013 on a dock overlooking the bay in Utila. But for me, the story of people and travel in Honduras stretches many years prior. I first arrived to the country in 2005. I spent that summer in Honduras. Then I went back again the following spring. And again the following summer. Revolution and political uncertainty kept me away for a few years. But I yearned to return and, several years later, I did. I spent the month surrounding Christmas of 2011 on Utila. Then I spent another Christmas month there in 2012. Lindsay and I married there the following Christmas. In all I have spent nearly a year of my life living and connecting deeper with Honduras. It is part of our family history now. And, with all histories, there comes a balance in relishing the occasional glance backward with the driving ambition forward to one day return to a similar, blissful state. It takes four days of travel to reach Utila. The time required, aside from costs, has squashed any attempts we have made in recent years to return. We never had traditional 9-5 careers with built up savings and paid vacation. We’ve been hustling life the best we can. And prior to our recent journey on the road, we spent two years quite literally latched onto the dozens of foster children we raised. We had no time to go anywhere. In brief moments when our 8 children were finally asleep, we had only enough space to dream about the road trip we would take “some day” from Alaska to Argentina. Yet with each failed attempt to return to Honduras we have remained in contact with the truest of friends, Jose. I met Jose in 2011 as I searched for a church at which to spend Christmas morning handing our toys I had brought with me to the island. He was welcoming and we became fast friends. My relationships with him and the small church congregation grew year after year. 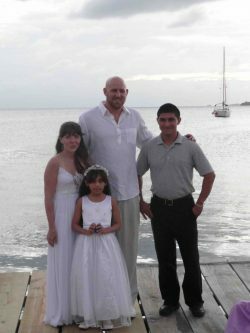 When Lindsay and I were married in 2013 it was in the presence of our Honduran family (yeah, we sort of eloped). Jose stood by my side and his family bore our rings and flowers. We haven’t seen Jose in nearly 5 years now. Yet every Sunday morning he sends us a text message and, though very infrequently, we get to catch up. In one of our last conversations Jose told me that he was thinking about joining a group headed toward the US. There were fewer and fewer financial opportunities for him. Even searching for $6 per day in honest work is exhausting. He told me that he was ready to take whatever chance he had to make it to the US. His dreams of a better life began with the US-Mexico border. A day of worrying about deportation was better than a day worrying about whether he or his family would eat. This is where I again find myself at the corner of Travel and Immigration. I want nothing more than the opportunity for Jose to have the decent life that every human deserves. But I can’t make this happen for him. For years we sent money to him. At least we knew he and his family would eat. But that was not sustainable. It didn’t change the lack of economic opportunity for him in Honduras. It didn’t change the country. But coming to the US illegally would not be the solution either, for either him nor anyone in any caravan. We have to meet at the corner of Travel and Immigration first. Is it possible that enough of us could travel to poorer places and leave the best parts of us there? It’s doubtful any of us have enough influence to change corruption and abuses of power. But could we invest our time, even just a little of it, helping people in some small way? Could we transfer hope to them? Could we show enough love (and perhaps a little financial assistance) that people would choose not to abandon their homes in reckless abandon? I’m a lumpy mix of idealism and realism. My greatest challenge in life is struggling to find the balance between the two. It’s excessively optimistic to believe that enough travel to any one place might tip the scales in favor of its people. Yet it’s depressingly realistic to think that sitting at home watching the news does absolutely nothing to help a people so desperate for hope. We choose to travel with purpose because we want you to join us someday on the road. We want you to bring the best you have to the people and places you go. And we’d be grateful if you left a little behind. If enough of us begin (or join) our own small caravans of hope I have no doubt that the world will, in some small way, begin to change. I won’t say we’ll ever do enough. We want to encourage you to find purpose before your next journey. And may that purpose involve the people you will meet in the places you will visit. People, like Jose, who will enrich your experience beyond your imagination and forever become a part of a smaller and smaller world. Read about why we choose to travel now!